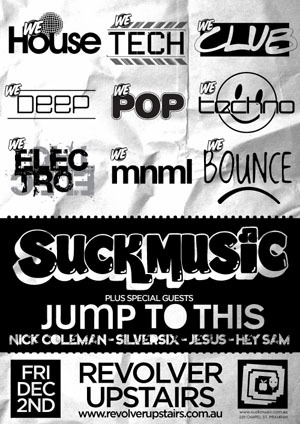 We would like to welcome fellow Melbourne record label “Jump To This” as our special guests. 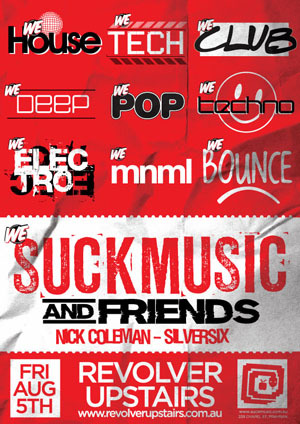 DJ’s Hey Sam & Jesus will be playing along with Silversix & Nick Coleman refreshed and inspired from his month in the USA. Monday night till tuesday afternoon at Revolver Upstairs rounds out a big weekend with a very big show. T-Rek has just finished mastering his new album and will debut some of it on the stage with his live band show alongside some familiar joint too. Honeysmack (live) joins him for a very long awaited return to the Revolver stage. Meanwhile Suckmusic are setting the recorders running in the back bar, capture a string of Melbourne’s finest going hour for hour all night on a single recording. With Mike Callander, Luke McD, Hey Sam, T-Rek, Silversix, Damon Walsh, Nick Jones and DJ Who. As you’d expect festivities culminate with Boogs vs. Spacey Space in the morning and right through until midday. 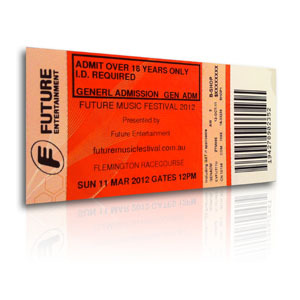 Suckmusic has managed to grab hold of some Furute Music Festival 2012 tickets. The price is $140 and we can deliver via registered post to your door. We have John Baptiste coming to play with us. His set at the Suckmusic Producer Party was on the money and one of the highlights of the night. 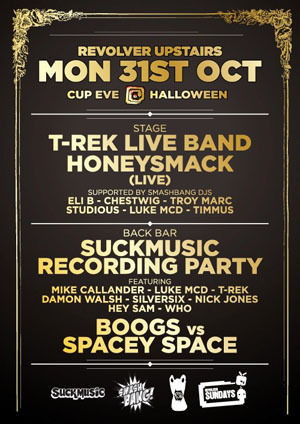 Suckmusic Members will receive free entry as always, while discounted entry is still available for everyone else using the ‘Suckmusic’ open list. Suckmusic members will receive free entry while discounted entry is still available for everyone else using the ‘Suckmusic’ open list.The back bar plays host to regulars Mike Callander & friends. See you in the front bar xoxo. 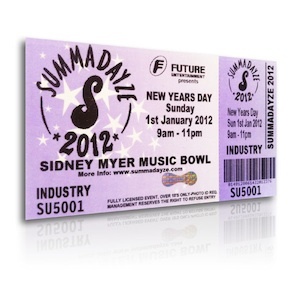 Suckmusic has managed to grab hold of some Summadayze 2012 industry tickets. The price is $125 and we can deliver via registered post to your door. Ticket prices increase in two weeks to $145 and then increase again after that. 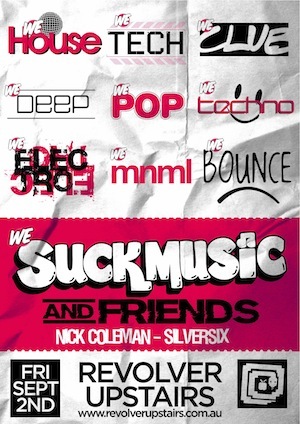 Melbourne’s iconic venue ‘Revolver Upstairs’ welcomes ‘Suckmusic & Friends’ into their Friday night rotation. 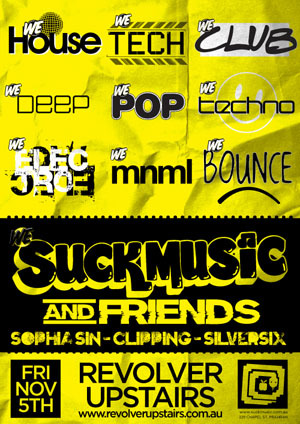 The first Friday of every month beginning on the 5th of August, Suckmusic will be inviting some special friends & guests along to play. The night will begin from 1am until the sun has well & truely come up. 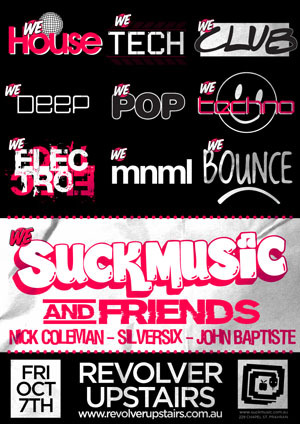 Suckmusic members will receive free entry while discounted entry is still available for everyone else using the ‘Suckmusic’ open list. The back bar plays host to regulars Mike Callander, Katie Drover & special guest Luke McD. See you in the front bar xoxo.